Use the search box below if you know your specific event, or browse displays with the menu up top! If your area isn’t holding a display this year, please check for a neighboring community. And if it’s at all possible, please donate, or volunteer to help out. 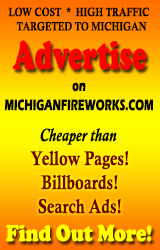 Don’t let the community fireworks displays go the way of the drive in theaters in Michigan! Over the years this has become something of a massive project (specially with seven sites total) and I need help getting the latest information on upcoming fireworks displays! If you know of one in your area, or if you’re responsible for putting one on, or you have better details on one than I have, I am begging, pleading, asking you to use the submit form, or drop me a line – via my contact form, on the Facebook page or on Twitter. I am dedicated to keeping this the biggest and most comprehensive list of fireworks displays anywhere, but… Michigan is a biiiig state. I particularly need more information on events in the Upper Peninsula; I lost my source up there. Thanks in advance! Pssst… we’re working on a whole new design!